I have wanted to visit these mountains for a very long time. 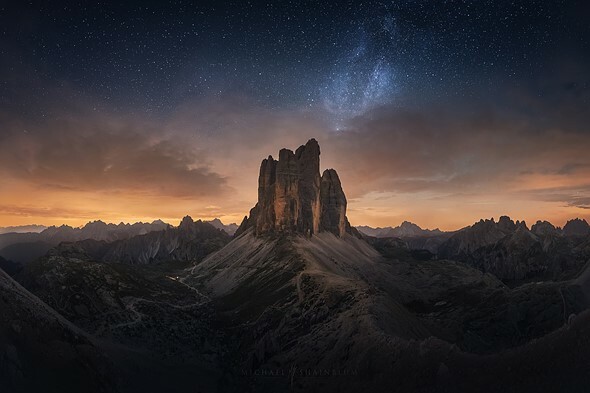 The incredible shapes and formations found in the Dolomites are like something out of a fairytale. The hike up to Tre Cime was absolutely gorgeous and the location is really accessible. On this night, hiking under the stars wth my girlfriend Serena, who is also a landscape photographer, barely felt like reality… okay, I suppose once the wind picked up, it started to feel a bit real again. Once we got up there, we walked around a little bit to check out different views and angles. The night was particularly chilly and we weren’t prepared for it. We hunkered down by some rocks and halfway through the night, noticed an incredible flash of light that lit up the sky for a few seconds. It was one of the brightest shooting stars that I’ve ever seen in my life. The whole evening just felt really magical. I used the Sony A7S with Canon 16-35 for this Panorama image, the wide perspective was created by 8 vertical images, stitched together. The orange glow on the horizon is light bouncing off nearby towns and creating light pollution. The photograph was processed and color corrected using both Lightroom and Photoshop. Michael Shainblum is is a landscape, timelapse and aerial photographer based in San Francisco, California. He has been working professionally as a photographer and filmmaker for 11 years since the age of 16. To see more of his work, visit his website or give him a follow on Facebook, Instagram, and YouTube.